Aurora kit held the reins for years in the 1/48 scale. In 1989 the brave effort of Blue Max gave us a truly more accurate version of the Dr.I. The highly detailed “White metal” motor was the main draw to many modelers. The Blue Max kit was hindered only by the “pinning” needed to attach wings and struts securely. Still, to the collector the Blue Max kit is a must have item in any case. Finally, the first effort in the WWI arena for Dragon Models Limited (DML) was its fine production of the Dr.I. Issued in 3 different pilot liveries this kit was the standard to date of the best Fokker Triplane in 1/48 scale. I personally have built 35 of these DML kits since 1992. The later Hong Kong issue is lessened by the poor type of photoetch included for the Spandau machine guns. Now we have Eduard’s long awaited offering. First released 13 May 2008. The second issue came on December 2009. There were to initial releases called “Der Rote Flieger”. The 1136 issue and the 1136X issue. Now they have released their Dual Combo kit #8161. This last Dual Combo edition is what we will look at here. Note some of the parts are for either the F.I pre-production triplanes or the Dr.I main production triplanes. The kit profiles are aimed at production types. Page 3. Ignore the kit instructions for color applications especially concerning the interior fabric surfaces. The interior wood faces should all be clear varnished on the Dr.I . The only painted portions were the metal fixtures. According to photos of crashed Dr.I types where we see the cockpits opened up to extract the wounded pilot personnel. These photos show that a light grey green or mid to light grey was used on metal surfaces. Instrument backing cup should be mid green or black. The triangle shaped fairings that flare the fuselage sides (PP A 1 & B14 ) and flooring panels ( PP B 5 ) should be varnished wood. I begin with cleaning the simulated fuselage skeletal structures ( PP C 16 & 19.) Then I add two short sections of brass rod under the flooring that run from on lower longeron to the other. These items can be painted as you add them. I added a small tab of plastic to the lower end of the control column (PP C 29) - use a .080 gauge drill bit to cut into the ends to add the wires going back toward the rear area under the seat. I am not enthused with this piece. Normally I would replace the kit control yoke with a Tom’s Modelworks or Part of Poland photoetch item. Eduard has not gotten this right with any of their Fokker kits. The lattice (PE 5) is supposed to represent the “Bowden cables” for the Spandau machine gun triggers. It seems Eduard thought that using PE would give this assembly some strength. You will have to scratch build the fuel tank air pressure hand pump for the right side of the cockpit. Solder can be used to make the “air hose” and give it a half loop at the bottom and it should lead forward to the engine area. The pump itself should be bare metal / aluminum and the handle black. The rudder bar stabilizer and forward gun mounts ( PP C 6 ) and the rudder bar ( PP C 40 ) unite to form the basis of the cross members that the ammo box (PP B 6 & PE 22) and empty ammo belt box ( PP B 4) will hang from. The compass assembly (PP C 26, PE 6,12 & 16) is nicely detailed. Paint the inside of the fuselage halves ( PP A 1 & B 14 ) an off white / linen colour before joining permanently. The plywood fairings are as stated, varnished wood. The three support structures for each of the fairings was metal tubing. At this time add the rigging material of your choice to the cockpit controls. According to the seat from 425/17 in Canada’s Royal Military institute you should add .040 to the underside of the seat (PP C 23.) Use a motor tool cutter to thin the inner face of the back and arm rest of the seat (PP C 23). The back of the aluminum seat ( PP C 23) was evidently covered in unbleached fabric on the inner face and the seat cushion (PP C 13) was the parachute pack. I add the seat cushion to the underside of the seat to get the depth and simulate the parachute pack texture and harness rings on the kit seat itself. The outer face would be aluminum. I will usually replace the seat supports ( PP C 3 X 2 ) with bent brass rod and add a cross brace to rest the front edge of the seat ( PP C 23 ) on. The harness assembly ( PE 1 & 2 X 2 ) are easily pressed in place but add a clear dull coat to the pre-painted faces them first and let dry. Begin with the harness buckles and work out to the other ends. Once shaped the item can be glued into place again starting with the buckles and working outward. The screen / bulkhead ( PP C 12 ) can be painted to represent unbleached / clear doped fabric. The reinforcement edge was leather. The horizontal bar on the screen/bulkhead ( PP C 12 ) is where the back of the seat rests. This was attached with seven pop rivets. The ammunition box ( PP B 6 ) needs to be notched at its lower corners to match the original item. I will add a small block of styrene to the bottom edge that will be short enough to cause the “notch” I was speaking of. Check your references. Attach the ammo box ( PP B 6 ) to the framing ( PP C 19) using the notches and locator plugs provided on each item. The empty ammo belt box (PP B 4) and the rear machine gun support (PP C 39 & PE 11) are added here. Note the scrap view of the fuselage half showing the relative locations when in place. The handle to the air mixture quadrant ( PE 7 ) should be bent in slightly. The pilot should be able to reach this with his left hand and operate it without banging his knuckles. Also the “Bosch” staring magneto (PE 4) should not be added to this build. The starting magneto is represented by the rounded plate at the pilot’s left already molded to the fuselage. There is also a small bulk head added to the rear of the fuselage interior to act as a support later for the tail skid ( PP C 30) on page 6. The reinforcement edge (PE 3 X 2) is a fabric item that was sewn and doped in-place. Page 6. First start with the lower wing assembly ( PP B 1 & 12 .) Using a square, a dry fit will tell you that the fuselage “cut-out” for the lower wing needs to be sanded / filed back or the lower wing ( PP B 1 & 12 ) will NOT sit square. Once the lower wing is in place, make sure it is likewise square to the middle wing ( PP A 2 ) and at this point fix the modified struts ( PP C 7 & 42 ). As long as the interplane struts appear to be continuations in angle the top wing assemble (PP A 10 ) will go on flawlessly. But there is a problem with the top wing you will have to fix first. More about that on page 10. The underbelly fuselage seam is fixed with the same stitching strip (PP C 22) as they used on their Fokker D.VII kits. The chin plates (PE 19 or 20 ) are a nice addition and help set the front landing gear legs so there is a an even placement of the whole under carriage. The wing tip skids (PP C 38 X 2 ) are of course for the Dr. I types only. Also here is where they recommend the installation of the tail skid (PP C 30). Page 7. The photoetch machine gun ( PE 8 X 2, 10 X 2, 15 X 2 ) provided in the kit are very suitable. The jackets (PE 8 X 2) are easily rolled into a cylinder shape on an appropriate sized piece of sprue or the forming tool from the DML kit item. For those of you with an all plastic kit the sets from Tom’s Modelworks or Part of Poland will do nicely for details. This allows the pieces to form precisely. I like to add the rear sights provided in smaller 1/72 scale kits at the are more “in-scale” for 1/48 than other aftermarket kits in 1/48. Note also that there is a metal plate with several pressed ridges under each gun’s blast suppressor attached to the cowling deck. If you can drill out the gun muzzles this is a nice touch. One technique to drill out gun muzzles is to take an .080 micro drill bit and push it through plastic sheet until you get a build up at the tip in a conical shape. If your using monofilament as a rigging material then drill out the smaller cable holes. Also the larger cabane strut locator holes should be slightly deepened at this time. After adding the control horns ( PP C 35 X 3 ) I set the rudder (PP B 10) and elevators (PP B 3 & 8 ) to match the control attitudes that I had already chosen before starting to build. The Oberursel Ur. II motor ( PP C 24, 28 & PE 23 ) cylinders should be a darker color (gunmetal) than the boss plate (aluminum.) The air induction tubes (PP C 24) are noted as being a copper metal. Then give the whole assembly a coat of transparent /thinned earth-dirty tan. Page 8. Wait to add the cabane struts ( PP C 14 & 21). Check the wings for straight and level appearance. Some kit examples may need flexing in warm water. Again if your using monofilament it may be necessary to drill through the top wing ( PP A 10 ) for the dual aileron cables and the holes for the cabane struts. The clear inspection window in the top wing needs to be drastically relocated to a point where it would actually be represented as being over the wing spar. No raise edge either. How they got this wrong is still a mystery to most WWI aviation kit builders. So it should be sanded down and relocated in line with the main spar. The flare cartridge holder ( PP C 8 ) is an item that was added in the field and its location varied. When attaching the top wing (PP A 10) align it so that the pitch is similar to the others. Page 9. Is the axle wing (PP A 6, 7, B 13 ) and wheel (PP B 9 X 2) assemblies. Sand off the details on the underside of the axle wing ( PP A 7 ). With the wing axle mid section (PP B 13) I routed out the plastic axle and replaced it with a brass rod of appropriate diameter. Next before adding the landing gear legs (PP C 15, 20 37 & 41 ) to the wing axle (PP A 6, 7, B 13 ) cut the legs down approx 1/16 of an inch on all four legs. There are 2 propellers types offered by the kit. Axial (PP C ) and Heine (PP C ) and note that Eduard has referenced the right application to the profile provide in the kit decals. It is the pitch and length of a propeller that determines the engine application. The paddle profile was the company hallmark. There are several ways of approaching the challenge of painting a laminated propeller. First give the item a coat of acrylic “buff” or linen. After thoroughly dry, give in a flat coat and let that dry. Paint the dark wood laminations in enamel on one blade. Then paint the other to match by using a simple paper template. Often I prefer to build my own laminated wood replacements. The “Reich” / government ownership plate ( PE 21 ) should be applied to the pilot’s right side of the cowling ( PP B 11.) It seems there should be a smaller plate over the larger one. Continue to rig the tail unit. Page 10. Fok. Dr.I serial unknown but probably 21X/17. Dr.I 212, 213, 214, 216, & 219/17 are accounted for. Eduard implies on the box art that it is 218/17. But that is not known for sure. While they did get the box art wrong the profile at the bottom of the page and 10 are correct. the white areas should be on the pilot's right for this aircraft. Ltn. Frommherz usually employed a unique ring & bead gunsight seen on this and one other Dr.I he flew. Ltn. Hermann Frommherz was born on August 10th, 1891 in Baden Walds. Until June, 1915, he served in the infantry on both the eastern and western fronts, after which he served with bomber units over the French and Macedonian Lines. Coming from Kampf Geschwader 1 (Bombing unit one) he arrived at Jasta 2 (Boelcke) on 22 March 1917. Then on 29 July 1918 he was transferred to temporary command Jasta 27 . On August 7 1918 the position was made permanent and he served as the Jasta 27 commander until the end of hostilities. He was nominated for the Pour le Merité, but it was not awarded due to the end of hostilities. After the end of the war, he served as an instructor in the Soviet Union and China. At the start of the Second World War, he was th CO of I./JG 134. Page 11. Next is Fokker Dr.I 564/17 (Eduard may have gotten this wrong ?) was rec'd at Jasta 11 on 6 April 1918. The motor was the Rhemag copy of the Oberursel Ur.II (Rh). AS has beem mentioned Ltn. Werner Steinhäuser flew this and one other similarly marked Fok. Dr.I where the colour placements of red & yellow were reversed. The second and later aircraft (that was probably the Dr.I 564/17 )had the colours reversed on the fuselage band and tail markings. Most images of this machine show it with "Balken" (straight armed) crosses ordered in March 1918. Those were added probably in late April 1918. "To improve the recognition of our aircraft, the following is ordered:" . . .
in paragraph 2, second sentence: "This alteration is to be carried out by 15 April 1918." The closing sentence reads: "Order 41390 is to be speedily executed." Very clear, the cause and the action. This directive supplements the directive of 17 March 1918. . .Balken means beam, it was called the beam cross. Originally Ltn. Steinhäuser had come from the Feld Artty Rgt. Nr.61 (2 Grossenherzog von Hessen.) These colours were from his former regiment. Ltn. Werner Steinhäuser came from AFP 4 on 17 Nov. 1917 and on 17 March 1918 he was WIA. He came back from the hospital on 2 April 1918 and on 26 June 1918 he was KIA. Page 12. Fokker Dr. I 545/17. Ltn. Hans Weiss, a native of Hof, went through typical service of units equipped with two-seat aircraft. After training with Jastaschule Valenciennes, he was attached to Jasta 41. After accumulating ten aerial victories, he was transferred to Jasta 10 on March 17th, 1918, where he gained another kill. This Fokker Dr.I 545/17 in the markings of Ltn. des Res. Hans Weiss. A flight or "Kette" commander and served at Jasta 11 a month and a day before falling in combat. Ltn.d.R. 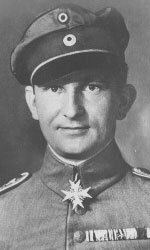 Hans Weiss - stellvertreter Kommanduer (acting comannder) of Jasta 11 on 8 April 1918 and on 2 May 1918 was KIA. It is safe to say that the extensive overpainting of his machine was done because he was a kette (flight) leader and the Jasta 11 acting commander before his death. On April 22, 1918, he gained his final, sixteenth, victory, after which he was killed in the illustrated machine by gunfire from a Camel flown by M. S.Taylor of No. 209 Squadron, RAF. The problem areas I see are The forward fuselage (from a vertical line at the leading edge of the middle wing) and cowling were red. The landing gear legs were the under surface light blue when photographed not red. Page 13. Next is Fokker Dr.I 213/17 as flown by Ltn. des Res. Friedrich Paul Kempf. The machine was rec'd on 12 Jan. 1918. Friedrich Kempf was born on May 9th, 1894, in Freiburg. He entered military service in 1913 after putting his technical studies on hold. In May, 1915, he transferred from the infantry to the air service. He flew with the bombing unit Kagohl 4 on both the Western and Balkan fronts. He came from AFP 1 on 8 April 1917 to Jasta 2 (Boelcke). On 17 Oct. 1917 he was transferred to JsSch I as an instructor. He returned on 28 Jan. 1918 and stayed until 18 Aug 1918 we was returned to JsSch I as an instructor, where he stayed until the EOW. Ltn. des Res.Kempf flew this machine and another one similarly marked “Kempf. Kennscht mi noch?”, translating to “Kempf. Remember Me?”. The problem areas are the fuselage below the tail was painted with the white on the pilot's left and black on the right side. Jasta 2 as well as other aircraft in the nearby JG III (Jasta 26, 27 & 36) had many of their Dr.I machines augmented with stay bars / rods behine the rear landing gear struts. Dr.I 213/17 had these. These were standard items in the DML / Dragon kit. Dr.I 213/17 also carried Kette (flight) leader's streamers on the lower interplane struts. Page 14. Fokker Dr. I 577/17. The aerial exploits of Rudolf Klimke were certainly not uninteresting. In 1916, he gained his first aerial victory on the Russian Front as a pilot attached to FFA55. In May, 1917, piloting an Albatros C.VII of FA19, he mounted a solo night attack on London, together with his observer, Leon. After transferring to Jasta 13/KG 3, he served on Gotha bombers. On July 7th, 1917, the crew consisting of Klimke, Leon and Reintrop shot down a Sopwith figter over London. Later, Klimke went through training at Jastaschule I, and on he was transferred to Jasta 27 on 12 Sept. 1917. The a year later on 21 Sept. 1918 when he was severely WIA. He managed to land on his own airfield, but was almost killed in the bombing of the hospital. He was not able to return to his combat unit before the end of hostilities. The problems here are that the wing crosses in the profiles all have borders that need to be thicker. Also the pilot's left middle wing tip has some noteable repair work. Page 15. This machine was received on 10 Jan. 1918. Originally it was tested with a Goebel Goe. III. An experimental rotary motor that ranged from 145 - 160hp. By the time it got to Jasta 12 is was equipped with the standard 120hp Oberursel Ur.II. Hauptmann Adolf Ritter von Tutschek was born on May 16th, 1891 in Ingolstadt, Bavaria. After graduating from the Royal Bavarian Cadet School, von Tutschek's joined the 3rd Bayerischen Infantry Regiment in 1910. During the war, he distinguished himself in combat while serving in France and on the Eastern Front. Severely wounded during a gas attack at Verdun (his second wound of the war), von Tutschek was ill for months. For displaying combat prowess against the Russians, he was awarded the Knights's Cross of the Military Order of Max-Joseph, which granted him the use of the title of Ritter. When he recovered, he transferred to the German Air Service. After relevant training, he undertook the typical tour – service with FA 6b from October, 1916 to 25 January, 1917. Subsequently, he was attached to Jasta Boelcke, where he gained three aerial victories, and on April 28th, 1917, was named CO of Jasta 12. On July 28, he got his twentieth kill, and on August 3rd, 1917, he was awarded the Pour le Merité. On 11 August 1917, von Tutschek was badly wounded in the right shoulder when his black-tailed Albatros D.V was shot down by Charles Booker of 8 Naval Squadron. Out of action for six months, he wrote his memoirs while recovering: Sturme and Luftsiege (storm and Air Combats). On 1 February 1918, von Tutschek was given command of Jagdgeschwader II. Mid-morning on 15 March 1918, the triplanes of JG II tangled with the Royal Flying Corps near Brancourt. Tutscheck was killed when his Fokker Dr.I (404/17) was shot down by an S.E.5a flown by South African ace Lt. Harold Redler of RFC 24 Squadron. When his body was recovered the linen hankerchef that was knotted through a button hole in his flight suit was still tucked in place. This was used to wipe his goggles off during combat. (from the rotary castor oil exhaust). Hauptmann von Tutschek was hit before he knew he was being engaged. The problems with this profile are there is a black band behind the white cowl that stops at the leading edge of the middle wing. Also there should be a Morrell Anemometer on the pilot's left upper interplane strut. This is an air speed incicator that is attached to the strut. The Eduard Fokker D.VII kit has these. At far right on the box top side panels. The Jasta 19 machine with the white lightening bolt is Dr.I 503/17. Possibly there was not enough room for the 3 needed lightening bolts? So they went with a scheme that employed similar crosses. Ltn. Hans Weiss' Dr.I 545/17 was the replacement. Page 16. Wing Stencils and their locations for the Dr.I triplane. Cross & Cockade Int. (GB) Vol 6 #3 Fold out Cutaway diagram. 1975. Cross & Cockade USA. Vol21 #1 Pp. 81-90. Jasta 14, 1980. Cross & Cockade USA Vol23 #4 Pp.318-334 Baumer & Dr.1 204/17, 1982. Fighting Triplanes by E. Hadingham, Macmillian Pub. 1968. Fokker Dr.I Aces of WW1, by Van Wyngarden/Franks, Osprey Pub. Aircraft of the Aces series #40, 2001. Fokker Dr.I Datafile # 5 by R.Rimell, Albatros Pub. Ltd. 1987. Fokker Fighters by A. Imrie, Vintage Warbird Series #6, Arms & Armour Press.1989. Fokker Dr.I, Flugzeuge die Geschichte Machten by J. Kranzhoff, Motorbuch Verlag, 1994. Fokker Dr.I Jagdstaffeln by Greg VanWyngarden, Albatros pub. 2007. Fokker Dr.I Special Datafile by R.Rimell, Albatros Pub. Ltd. 1991. Fokker Triplane-ology by A. Imrie, C&C Int. Vol.23 #4, Pp.57-64, 1995. Fokker Triplanes in Service by Dan San Abbott, Over The Front Vol 5.#4 Pp.326-339. 1990. Fokker Triplane by A. Imrie. Arms & Armour Press. 1992. German Fighter Units - June 1917-1918 by A. Imrie, Osprey Pub. 1978. Pictorial History of the German Army Air Service by A. Imrie, Ian Allen Pub., 1971. Highs: As has been discussed in the review concerning the premier kit "Der Rote Flier" 1136X, this is a highly detailed kit. The Good thing is that Eduard did not skimp on the PE this time. There is plenty to do two full builds. Lows: Eduard's description of the streaking method employed by the Fokker Co. on these airframes is VERY out dated. All upper surfaces were clear doped linen and then streaked not light blue then streaked. Verdict: I have to give it to Eduard. This is a good kit. But their basic colour information contained with the instructions and the streaking does them a dis-service. Still for the modeler armed with current inormation You can not go wrong. Thanks Charlie, The black band I was speaking about was on the fuselage vertical sides and the upper deck. It did not continue to the chin pan area. These upper surfaces were areas that got a good amount of the castor oil exhaust and had to be sanded down and repainted during maintenance intervals. "Fokker Dr.I 404/17 . . .The problems with this profile are there is a black band behind the white cowl that stops at the leading edge of the middle wing. Also there should be a Morrell Anemometer on the pilot's left upper interplane strut. This is an air speed incicator that is attached to the strut. The Eduard Fokker D.VII kit has these. . . "
The rear of 404/17 is black. Click here. ". . .Hauptmann Ritter (knight) Adolf von Tutschek. This machine was received on 10 Jan. 1918. Originally it was tested with a Goebel Goe. III. An experimental rotary motor that ranged from 145 - 160hp. By the time it got to Jasta 12 is was equipped with the standard 120hp Oberursel Ur.II. The black band behind the cowl went from narrow to a wider version as the service life lengthened. After graduating from the Royal Bavarian Cadet School, von Tutschek's joined the 3rd Bayerischen Infantry Regiment in 1910. During the war, he distinguished himself in combat while serving in France and on the Eastern Front. Severely wounded during a gas attack at Verdun (his second wound of the war), von Tutschek was ill for months. When he recovered, he transferred to the German Air Service. After pilot training, served as a two-seater pilot with FA 6. On 25 January 1917, he was assigned to Jasta Boelcke as a scout pilot. Having scored three victories with this unit, he was given command of Jasta 12 on 28 April 1917. On 11 August 1917, von Tutschek was badly wounded in the right shoulder when his black-tailed Albatros D.V was shot down by Charles Booker of 8 Naval Squadron. Out of action for six months, he wrote his memoirs while recovering: Sturme and Luftsiege (storm and Air Combats). On 1 February 1918, von Tutschek was given command of Jagdgeschwader II. Mid-morning on 15 March 1918, the triplanes of JG II tangled with the Royal Flying Corps near Brancourt. Tutscheck was killed when his Fokker Dr.I (404/17) was shot down by an S.E.5a flown by South African ace Lt. Harold Redler of RFC 24 Squadron. When his body was recovered the linen hankerchef that was knotted through a button hole in his flight suit was still tucked in place. This was used to wipe his goggles off during combat. (from the rotary castor oil exhaust). Hauptmann von Tutschek was hit before he knew he was being engaged. The problems with this profile are there is a black band behind the white cowl that stops at the leading edge of the middle wing. Also there should be a Morrell Anemometer on the pilot's left upper interplane strut. This is an air speed incicator that is attached to the strut. The Eduard Fokker D.VII kit has these. . ."
That would be the Fokker streaked camo. Olive streaked over CDL. Type letters DR.I on the original plane is written in the style where the Roman numeral 'I' is a little bit smaller than the rest of the DR letters and on decals is of the equal size. All you have to do is to trim this decal before place it on the kit. One of two known shots concerning Ltn. des. Res. Herman Frommherz and the Fokker Dr.I in this profile. While he used his rgt colours here the "X" is a reference back to his artillery beginnings. I was a map reference used to identify friendly troops. Klimke's own mother insisted that he use the anchor on his aircraft a a symbol of good luck and hope. The "Bosch" starting magneto PE 4 they include (that they tell you to put near the pilot's foot) is bogus. It was designed for inline motors not rotary engines. I used the kit mold to show the relocation. In truth there should not be a raised edge. It is clear covered in a Cellon. Simply erase the edge and relocate hole. Then fill with a clear section of sprue. Model built by Wojtek Fajga. Images used with his permission. Model built by Wojtek Fajga. Images used his permission. Model built by Wojtek Fagja. Images used his permission.